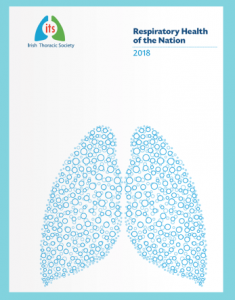 The Respiratory Health of the Nation 2018, published in December 2018 by the Irish Thoracic Society, is a major new report on the burden of respiratory disease in Ireland. Respiratory Health of the Nation represents a large body of work and the Irish Thoracic Society would like to thank the authors – Dr Máire O’Connor, Specialist Public Health Medicine/Epidemiologist, HSE East; Ms Eimir Hurley, SPHeRE PhD Scholar/Pharmacist & Biostatistician, Centre for Health Policy and Management, Trinity College Dublin and Professor Terry O’Connor, Consultant Respiratory Physician, Mercy University Hospital Cork – for their commitment and expertise. We hope the report will be an invaluable resource for policy-makers, healthcare providers and professionals, researchers, patients and their families as well as the wider public. If you require any further information please contact us at info@irishthoracicsociety.com or Tel: 01 5677201.